Choose and book a dentist in Karon Beach, Phuket with Dental Departures. We’ll help you find a reliable dentist so you can make the most of your dental holiday. Thailand’s Phuket is a renowned holiday destination, famous for its sandy beaches, turquoise waters and frenetic nightlife. Karon Beach certainly features the former two of these - a long, gently-curving sweeping stretch of sand, dotted with small sand dunes and a few palm trees and casuarinas, fringed by inviting crystal waters. However, it is a fairly peaceful place, devoid of the commercialization found in nearby Patong. The main area of the beach features a paved promenade with streetlights. In the low-season everywhere is pretty-much shut by11.30pm and anyone wanting any entertainment beyond this will have to head to nearby Kata. For a peaceful, relaxing holiday without a party atmosphere this is the place to be. Karon consists of three main areas – Aroona Plaza to the north, featuring the beach promenade, a few bars, restaurants, handicraft shops and a hotel built in the Sino-Portugese architecture of Old Phuket. The central part is pretty much taken up by the grounds of the Hilton Phuket Arcadia and the Thavorn Palm Beach Resort. South of here is The Karon Plaza where you will find more restaurants, bars and guesthouses. Exploring some of the side sois may bring you out into some interesting places, including a small art community featuring a complex of huts, galleries and bars that some Thai painters have built and where they work and live. Karon is great for unwinding – its beautiful long beach, bazaars, restaurants and low-key bars and nightlife make for a relaxing ambience and just the thing for a bit of TLC after your dental treatment. Karon Beach is located in the south-west of Phuket, around 5 miles (8 kilometers) south of Patong – near enough to visit if you want to experience some raucous nightlife, but far enough away to avoid it completely. Karon Beach may not be as commercial as some other areas, but that doesn’t mean that its facilities are in any way inferior. 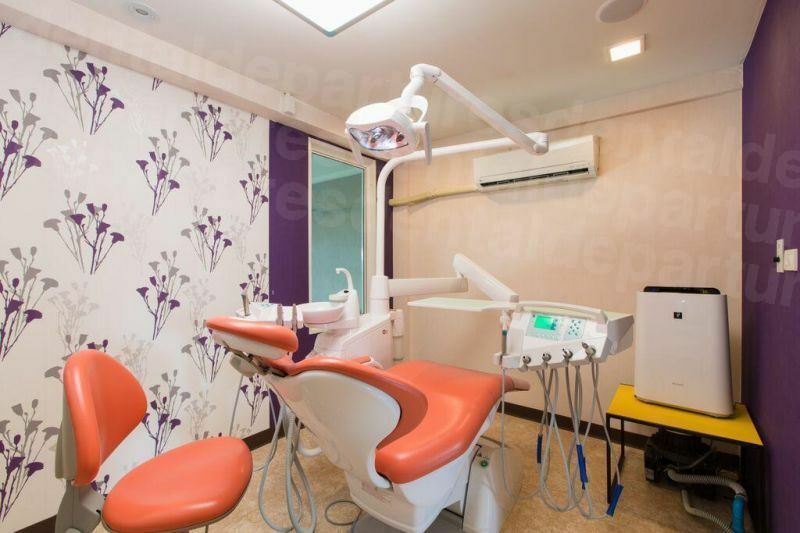 In common with most dental clinics in Thailand that treat overseas patients, Karon’s clinics are as highly-equipped – and its staff as well-qualified – as any other recognized centers. Where to stay in Karon Beach? There are accommodation options in Karon Beach to suit all budgets and tastes. From luxury resort hotels to modest backpacker hostels you will find the perfect place to stay during you time here. Thailand is very safe for tourists, and Karon Beach is no exception. Crime is generally low, and most crimes against tourists are from opportunistic thieves – so do take care of your possessions. Tourists are far more likely to be injured when taking part in activities – and it is advisable to be extra careful on motorcycles; and to be aware of jet-skiers if you are swimming in the sea. The rip-tides around Phuket can be dangerous, especially at certain times of the year, and it is advisable to stick to the designated swimming zones. Many of our patients say that the quality of care they receive in Thailand is better than at home! Of course, there are good and bad dentists everywhere, but the key to getting good treatment is in finding a quality dentist, which is why finding and booking your dentist with Dental Departures makes sense. We have already pre-screened our clinics, checked and verified our dentists’ qualifications and taken the guesswork out of finding a reliable dental office. This information is freely available on our website, along with high resolution photos, virtual tours and real patient reviews – so you can get a good overall picture of your chosen dentist before you even get there. What happens if something goes wrong? Do Karon Beach dentists have warranties or guarantees? Yes – all of our dentists in Thailand have guarantees and warranties – not just on the actual procedures they carry out, but also on any lab work on prosthodontics, such as dentures, crowns and veneers. The nature of the human body is that sometimes problems can and do occur, even if all proper procedures have been followed. They are rare occurrences, but should you experience any problems we will make sure we get it sorted out. We also offer insurance for medical complications with a number of providers, giving you total peace of mind if you are at all worried about such eventualities. Karon Beach is a popular tourist destination for westerners and English is spoken widely. Our dentists throughout Phuket are more than used to treating overseas patients and have a good command of the English language, so you will have no problems talking to, or understanding, your dentist. What payment methods are accepted in Karon Beach? Cash is accepted everywhere, and most of our dental clinics take debit, credit cards and bank transfers. You will need to check specifically at your chosen clinic as to what are their preferred methods of payment – and this information is on the summary section of each clinic’s description on our website. When is the best time to visit a dentist in Karon Beach? Phuket is hot all year round, but April-May and September-October are the hottest. September to October is also the monsoon season, but even then it is rare to have consecutive days of heavy rain. Peak season is between December and March, when it is cooler. Even during peak season, the beach is so long that it rarely feels crowded. You can visit a dentist at a time suitable to you - they are open all year round. Some areas may prove difficult in a wheelchair but there are plenty of wheelchair-friendly hotels and resorts that are not based too far away from the shops and other amenities. The north of Karon Beach, around Aroona Plaza and promenade, is where most of the action is, and is reasonably accessible by wheelchair. Karon Beach is a picture-postcard tropical beach which is long and wide so you’re not going to feel crowded. At around 4km long, the area is not as compact as some may think, and while walking the length is fine, you may find you have to resort to taxis to get around a little more than you thought. Beach vendors may be a problem for some who prefer not to be bothered at all, but a polite ‘no thanks’ will see them on their way. However, for others they are a Godsend who save you having to get up to get drinks, ice-creams and some bizarre, random things that you wouldn’t even have thought about buying. There are a good number of hotels and resorts in Karon Beach that are wheelchair friendly with direct access to the beach. There is a long promenade which runs alongside the beach and is lined with restaurants, bars and stalls and is pleasant and easy to navigate for wheelchair users. What else is there in Karon Beach? Most of Karon Beach’s activities are centered around the beach, but because it is so long you will be able to find a spot that is deserted. The north end, in front of the lake, is a good place to go if you want the beach to yourself. Water sports enthusiasts will not be disappointed and there are jet-ski and parasailing operators walking the length and breadth of the beach looking for customers. Water ski-ing, wakeboarding and windsurfing are also popular activities, as well as the banana boat and sea kayaks. Karon Beach is very open to the elements and is not so popular with surfers as shifting sandbanks makes it an unreliable location. You may be lucky enough to see sea turtles, occasional nocturnal visitors laying their eggs in the sand – and its best to let your hotel know if you do see any so they can contact the Phuket Marine Biological Centre who will move the eggs to a place of safety to incubate them. Other attractions include Karon Temple, which is at the center of local activities, hosting night markets several times a week. Also of note is the Dino Park Mini Golf, best explored at night to view the high-tech effects. Further attractions nearby include Kata Beach and Patong Beach, which offer a livelier nightlife if you fancy a walk on the wilder side. Both international and domestic flights land at Phuket. Its around 50 kms/30 miles to Karon Beach by road. There are taxis or buses from the airport, or you can hire a car. It’s easy to book one of our great dentists in Karon Beach - call toll-free or book online. Take virtual tours, view clinic photos, read real patient reviews and discover our exclusive discounts. Book with Dental Departures for quality-checked dentists, at the best prices around – guaranteed.